Holly graduated with a BA from Emory University, where she competed on the varsity basketball team and began her sports medicine career gaining invaluable experience working in the varsity athletic training room. She proceeded to earn her Master’s in Physical Therapy in June 2000 from Nova Southeastern University. 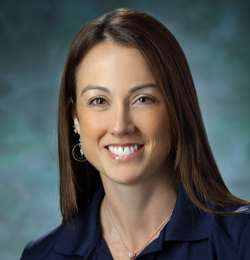 Holly has worked in orthopedics and sports medicine since graduation, and has treated a diverse population of orthopedic clients in Chicago, Maryland and Washington DC. Her continuing professional education includes coursework in strength and conditioning, shoulder, knee and SI joint dysfunction, joint mobilization, joint reconstruction, Mulligan techniques, and APPI pilates training. During client sessions Holly incorporates manual therapy, exercise, and postural training in order to develop a maintenance program tailored to the needs of each individual client. Holly believes that rehabilitation through manual therapy, strength and stabilization most often leads to recovery and improved function. She also feels that strength and conditioning programs can be useful in preventing re-injury in the future.